I hope everyone is off to a good start with the new year. Here in Maryland, it’s been cold and snowy, although I know many of you have seen far worse weather this winter. For me, it’s time to buckle down on the writing and make some serious progress on at least one WIP. And I need to get back into the blogging swing. To ease back in, I thought I’d start with some sundries. Suddenly, I was receiving triple-digit daily views on the blog, many accompanied by “unknown search terms.” But most of the views were coming to that semalt post, and readers I had never seen before began leaving comments. Even WordPress noticed the increased traffic, twice sending me notifications about my booming stats. Over a 7-day period from 29 December 2013 through 4 January 2014, 1,481 recorded views came to my blog, with many readers sharing their experience over those days with their own high numbers of views from semalt. As many of us would do, they searched for information on the company, which is scarce. So guess what had risen in the search results—my little November post. Before long, my post was the top result to their queries. The experience has given me a glimpse of what it would be like to be Freshly Pressed. And answering all those comments makes me wonder how popular bloggers handle that level of interaction on every post! Please do consider reading those comments—a really interesting set of bloggers has intersected on the post, and you’ll find many new blogs to explore. Despite “The Reader’s” devouring of our site views and rendering our stats worthless, the WordPress stats monkeys generated my year-end review post. Of course, they did it before the massive increase in views for my semalt post, so the numbers are even less accurate, but what the heck. I’d like to thank everyone (well, except spammers) who has stopped by to visit, follow, leave a like, or comment on my posts. This blog would be nowhere without you, and I truly appreciate the fact that you take time from your busy lives to pay me a visit. A special shout out goes to my Top Five commenters for the year. If you haven’t already visited these bloggers, what are you waiting for? Seeing new post notifications in my inbox for these great bloggers is always a day brightener. Carrie Rubin of The Write Transition, Kourtney Heintz, and Philosopher Mouse of the Hedge made 2012’s Top Five as well. I don’t have the words to say how much their continued support of this aspiring author means. If When I finally publish, you can be sure they will receive complimentary copies of my first book! I’ve tried to think about the blog’s direction for 2014, but I’m afraid I’ve been easily distracted from that particular exercise. I can tell you that I’ll be posting some long overdue book reviews and an extremely belated awards post. I also hope we’ll see more Saturday Sit Downs with authors and other creative types who have new works coming out this year. I’ve launched PerNoReMo 2 this month, hoping to reestablish the writing momentum I gathered in November but lost in December. If I’m serious about writing good novels, whether for a small audience or a wider public, I need to make serious progress on Death Out of Time this year. I hope to have my initial draft completed by the end of March. If I succeed, I’ll set it aside for April and then dive into the editing and revisions in May. If all goes well, Draft 2 of the rebuild will be ready for a first round of beta readers by early June. Of course, it doesn’t help that Scrivener keeps track of the words we delete. Seriously, I’m making better progress than this graphic would indicate! If any of you actually read this screen, this clip is absolutely a FIRST DRAFT!!! Meghan Bode has been quiet of late, respecting the time needed to rebuild Madeleine O’Brien’s Death Out of Time. But I won’t rule out the possibility that she’ll spring another short story on me for the blog. I know she has fans who would like to see more of her, and I don’t want to disappoint them. I suspect she’ll sneak in if I try to write some archaeology posts. So we’ll see how the year unfolds. Heck, maybe I’ll even change gravatars or set up a new page for Death Out of Time to replace the one I took down last summer. I only hope that you’ll continue to enjoy what I do post during the year. Time to get the journey underway! What new plans do you have for 2014? This entry was posted in blogging, Death Out of Time, Meghan Bode Mystery 3, science fiction, writing and tagged blogging, google rankings, WordPress, writers, writing. Bookmark the permalink. Thanks for the shoutout, JM. 🙂 Yours is a blog I always enjoy reading, because it has so many different facets to it, like that semalt post. It’s funny, how circles of readers can overlap on topics we might otherwise overlook in our quest to be good bloggers. Great to see you got some additions to this lovely space! On a lesser note, I’ve heard so many people praise Scrivener. I have it (I “won” a copy a few NaNos ago), but I’ve never been able to get into using it as my primary writing table. I find a lot of the functions very neat – like compiling and formatting for submission – and I do start nearly every new project trying it out. But, I just can’t pull myself away from my Libre Office documents. Maybe because I write so much during my commutes, and I save back and forth on my server space, and the .odt docs open in most every word processing program. Who knows, though? Maybe the next 2014 project will open my eyes to the joys Scrivener provides so many of my writing buddies. Looking forward to seeing what new adventures you have in the new year! Multiple versions of the original story still exist, and sometimes I do look back at them and wonder at the evolution of the characters and plot. 🙂 When I’m working on a story, I try to save a version at least once a month. Sometimes I can take an element that was dropped and revise it for the new version, or even recycle it into another story. It doesn’t take that much disk space to save them, and nothing goes to waste! Thank you again for all your support, Mayumi! Fun to see what your plans are or what they might include. Makes me think I should be doing some planning myself, but other than “complete another book in 2014,” I haven’t gotten too specific. I hope to finish an outline in six months, write the first draft in three, and use the last three months for the editing drafts. That time frame worked well for me last year. Hmm, “I hope to finish an outline in six months, write the first draft in three, and use the last three months for the editing drafts” sounds like a specific plan to me! And I’d put money on you succeeding with it, too. 🙂 I need to find my way back to that level of commitment. I had it from 2009 into 2012, but then I faltered, especially in 2013. I’ll give it my best shot and see how I do. Absolutely. I find that I’m very limited on being able to follow new blogs now (sadly), but if someone only posts weekly, that’s much easier for me to follow than someone who posts near daily. I feel bad to have to be so limiting, but to continue visiting the blogs I love, I can’t keep filling my plate. Sigh. Those stats always keep me wondering when I see them. I guess it’s the same for you. Good luck with Madeleine. I’m excited to see her story in print in the future. I know you will be successful, because you are an organized planner and take time to reflect and see what you need to tweak in your writing now and then to keep focused. Best of luck for this year! Thank you so much, Char, for all your support and encouragement! Sometimes I wish Madeleine was “pushier” and would spur me to get serious about writing something every day. But she’s not, and I know that’s not really her job, either. I’m the one who has to get her nose to the grindstone. I think the key is to aim for steady progress rather than word counts that may be unobtainable. Then that focus may be easier to maintain. Best of luck to you, too! Word counts always make my head spin. I just write until I don’t enjoy it, then take a break either editing another story, eating chocolate, or getting lost in someone else’s book world. But I never count words each day, and really could care less. I guess I would have to if I had an agent or publisher breathing down my neck with a publishing date…but since I don’t, I let the story dictate word counts by how creative or not I’m feeling. JM, sounds as if you’ve got a solid plan! Good luck with all of it in 2014 and we’ll look forward to reading. I read a few comments from your blog regarding that weird company or whatever it was. Odd but then there’s so much I don’t understand about all that (even some of those comments). I just hope it’s all worked out now. (smile). 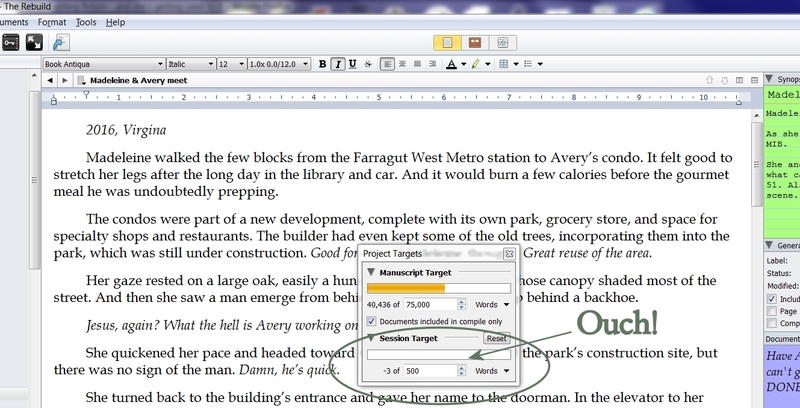 How do you like Scrivener? I just got it recently and it seems very complicated. I’m busy trying to figure it out instead of writing, so much so, I’ve purchased a book about how to figure it out. Lot of bells and whistles there. Happy New Year! You are so good at staying on top of stats and trying to make sense of them. I’m a Luddite with stuff like that and I can’t get Google Analytics to work either–shows everything at zero. I’ll have to get at that this year if I want decent feedback about my blog visitors. WP stats seem useless to me and your experience with them and writing about it helps me understand why. So thanks for that. As for your writing goals this year–you go girl! I’m terrible with stats! I struggled mightily in the one course I took in college. I started out as a Com Sci major and took 3 semesters of calculus before switching to Anthropology. But because of those calculus courses, I couldn’t take the Social Sciences stats course—I had to take the one designed for Math majors. Difficult and not helpful at all. And the thought of that class still makes me cringe. I will do my best to meet my writing objectives this year. If I could find the joy and inspiration of 2009 again, that would really help! Thanks for the shout out! 🙂 How cool we are in each other’s top 5 commenter list. I’ve just started the Scrivener tutorial. Part of me despises it. Part of me sees the value in it. Any time, Kourtney! Your blog is awesome, and fellow writers can learn so much from the experiences you so graciously share! Scrivener does have a learning curve, there’s no denying that. And, frankly, the tutorial is overwhelming with all the bells and whistles it shows. But as fiction writers, we can safely ignore many of them. 🙂 I love being able to write my scenes separately but have them accessible with a single click in the Binder. With a program like Word, we either must have a single file that becomes hundreds of unwieldy pages long, or scores of files for separate scenes that become a nightmare for finding and opening. Scrivener makes the whole thing manageable in one project folder. Once I got the hang of that, I was off and running. And now I’m cursing Word every time I have to deal with a large research report at work! I haven’t checked them out myself, but other bloggers have said the YouTube “how tos” for Scrivener are very good. They might be worth checking out. I love your Scrivener screen shot. I’ve been there! Especially when, okay, fine, so I’m -536 words. They were bad words. Bad, I tell you. The story is much better with them gone. And I replaced them with better ones, just…well…fewer. *sigh* Yeah, it doesn’t tell you that. Maybe we should contact them and offer this as a suggestion for the next update. 😉 Because, yes, those bad words from early drafts must go. But please give us credit for the good ones that take their place. Crazy way to start a year! 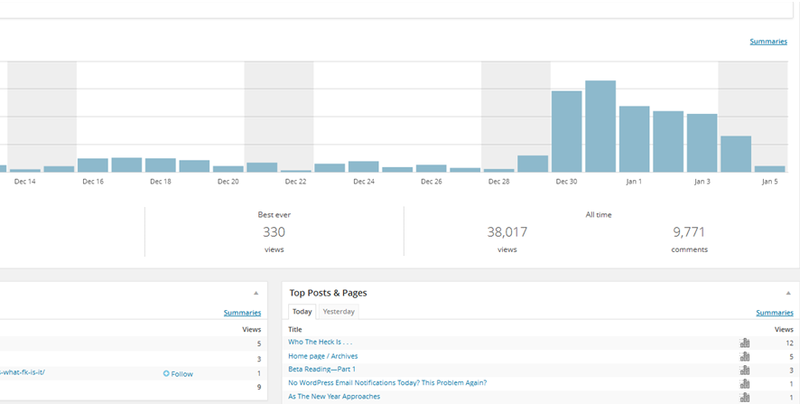 WP Stats/mysterious blog popularity continues. It’s getting pitched to the top in Google searches of a current “popular” subject…..and perhaps people snowed in? On New Year’s day I had the same thing happen. At first I thought maybe FP without noticing, but realistically people started looking for info/pictures about the Rose Parade float with K9s4COPs and police dogs. So it made sense (and I was glad as people were linking through to their donation/info site.) It was a post I tossed together extremely quickly – and it gets all the numbers…like the hurricane one earlier. No fine crafting, just blurting it out and it wins. A few new subscribers, but not a lot of comments. Right now All I can think is: just write. If you want stats, write about controversial extremely current topics(and do it 5+ times a week). Or improve writing skills and write solid posts and be content to slowly build a loyal audience that will interact with you. Anyway – you’re off to a great new year – can’t wait to follow your journey. I’m a firm believer in quality over quantity. That’s one of the reasons I cut down to one post per week, with only the occasional extra. I couldn’t keep the ideas fresh and interesting any more after that initial head of steam when I started blogging. And the time needed to post more frequently cuts into other things we could or should be doing. I still cringe when I see “advice” that aspiring authors should spend so much time “building an audience” through multiple social media platforms. Well, I’m a prime example of how that “audience building” results in delayed completion of the books we’re supposed to be writing! Part of the decrease in the time I spend writing is directly related to the time I spend blogging and reading other blogs. And I don’t even partake in other media like Twitter and Pinterest. I’ve got one novel with beta readers now and plan to start the next one soon. And then of course catch up on everything I let sit idle for the holidays: blogging, cleaning, crafting, etc. An update on that Semalt thing too. Have you Googled it recently? There are quite a few blog posts about it now–and still, no one really knows what it is. I just googled it, and I’ve definitely fallen in the search result rankings—that likely explains the decreasing views to my blog post about it. They’re definitely on a lot of people’s minds, but somehow I doubt that’s generating the business they would like. As long as there’s no danger to our blogs and sites, then I’ll be happy to just ignore them. Best of wishes for your beta read and working on the new novel! Until I read your post I’d never heard of Semalt. Maybe something that no-one will ever really know what it is. Spooky. From what little folks have gathered, it’s one of the Search Engine Optimization companies. I’m not particularly convinced that any of their motives for business are all that “pure.” Check your referrers in your stats now and again. I suspect there will be another wave of visits from them before too long! It’s fine with me that my post has now dropped in the search rankings as more people write about them. 🙂 How do popular bloggers like Carrie Rubin handle that kind of comment load with every post? I wouldn’t have time to work on my WIPs if I faced that every week. 🙂 I’d actually gotten comfortable with my low views, so that week was a real shock to my system. And the reality about those numbers on our stats pages? They’re not meaningful. 🙂 Since we don’t see views generated through The Reader or RSS feeds, the numbers we see on the stats page are incomplete. Really incomplete. Sometimes when I post, I’ll look at the number of “likes” that come in and see how many come in without adding a view to my stats. On occasion, I’ve seen 7 likes come in on a post, and yet it has 0 views. I’d like to say we could at least use the stats to see general trends, but even that might not be true. Without knowing exactly how the regular WP changes affect views, I’m not so sure we can even get that general insight! Like Pete, I hadn’t heard of semalt until this post. Is it a robot? Is it spam? It is a new search engine? What the heck is it? You had a rough year in 2013, so please don’t beat yourself up about how much you did or didn’t accomplish. I’ll bet it’s more than you’ve given yourself credit for. Did you see 4amWriter’s post yesterday? She also talked about the need to get some specifics in place. That’s what I’m also trying to do. And I’ve seem some great comments about “stepping” those specifics so we can check off successes as we go rather than having one big final total. That makes sense to me! I did see Kate’s post and it was a good one. It spoke to me on many levels. When I was in the thick of working on my novel I had a to-do list for it. Check for overused adjectives, make sure my it’s and its weren’t mixed up, one space between periods, and the like. I need to start a new writing to-do list. I like the tangible results of accomplishment and forward movement. This stagnation thing has to go! I am glad I know know about whatever the hell the name of that company is . . . semants? Good luck with everything. Semalt sounds like a nourishing drink! Thanks! Could there be a dark secret behind the name? As with soylent green? I’m with Kate when it comes to stats. I like to look at the bar graphs but I don’t really dig deeper than that. When you wrote the semalt post I didn’t even know where to look to see if they were in my stats and to be honest I still don’t 😉 And I definitely don’t know how Carrie, Kourtney and the other popular bloggers keep up with all those comments and try to respond to each one and get their writing done. I give them so much credit! I do love Scrivner – I love that I can back up my work so easily and compile new versions and drafts as I go. Since I’m so paranoid about losing my work, I do a back up and a compile after every session (too much? probably). Love your plans for 2014 – you know I’m in your cheerleading section rooting you on. You built some good momentum at the end of 2013 with your PerNoReMo so it’s good to hear your doing it again. Happy writing JM!!!! For me, they showed up as one of the referrers. 😉 I know I couldn’t answer that many comments on every post and still make progress on my WIPs. If anything, it’s made me realize that my normal low numbers are pretty darn manageable for me. And I shouldn’t wish for them to grow too much, too soon! I don’t back up that frequently, but when I’m making lots of steady progress, I’ll save versions every one or two weeks. You never know when we might want to revisit an earlier version after deciding part of it was better after all or to recycle a cut scene for another story. If we just keep saving the same file and don’t save earlier versions, then they’re lost forever. The encouragement I get from you and other blog buddies means more than I can possibly say, and I really and truly appreciate it. Now, if I can just get settled back into a work routine so I can meet those new PerNoReMo goals! I use the ‘compile’ feature and save a RTF (rich text format) of the draft with the date I’m editing. This way I can go back to the previous day’s version if I wanted to. Also, if I’m doing a major rewrite of a scene I use the ‘snapshot’ feature to capture the original version. It lets you roll back to that previous version, if you want to. I’ve never gone back to the original, though I have used parts in other sections. You can see how paranoid I get about this stuff. It’s not until I describe what I do that I realize how bad I am. LOL! I don’t think I’ve made it into the top 5 commenters on ANYONE’s blogs this time. I seem to remember last year that you were making it into the top 5 on lots of people’s and that was making you think that maybe you were spending a little too much time visiting blogs rather than working on your WIPs (or did I imagine that?). I too also wonder how those people who get 100+ comments on their blog every time manage to keep up with the responses. Good luck with your plans for 2014, and hope you’re managing to keep warm! I made it on a few this year, but nothing like last year. You remember correctly—I was in a lot of Top Fives, and I did feel like I probably spend too much time blogging and not enough writing. I still didn’t spend enough time writing in 2013, due in part to a major confidence crush and then events in “real life.” So I’m crossing my fingers that I can reestablish some momentum this year and get this WIP into a shape that an audience would enjoy reading! We almost reached the freezing point today, and by this weekend we should be back to nice temperatures for this time of year. I can’t complain too much, though, because my family back in the Midwest has had temps reach -15F with wind chills of -70F. That’s just flat out dangerous! I’d like to see more of Megan Bode, but not at the expense of your novel. I always enjoy our archeology posts. In any case, go for the momentum! And good luck. Meghan is a great character, and I hope it won’t be too long before she has a novel of her own. And just maybe she’ll have another story for the blog this year, or a new twist on the archaeology posts. I really hope so! How mysterious, this surge in stats. I went back and reread your November post and the update, but it does seem odd. Like you, I’d keep my guard up and err on the side of suspicion. I’m glad we connected in 2013; I love your down-to-earth posts and look forward to following your journey through this new year! I’m glad we connected, too! When I started blogging, I had no idea how many great people I would encounter and become “buddies” with. The support and encouragement we all offer each other is inspiring. And visiting each others’ blogs can just be darn fun, too. 🙂 I can’t wait to see what the year brings for you, too! Funny, I wondered about this Semalt as well when I saw in my stats and then saw what it was about. Didn’t sign up, too coincidental for me! Thanks for always keeping on top of the WordPress changes and awareness on the strange going on in land of world wide web!! Wherever you take us in 2014, I look forward to the trip! Hopefully posts like mine and the one you linked to are helping! The traffic to my post continues to slow, so maybe that means semalt has decreased their visits. Or maybe some hosts and servers have decided to block them. That might not be a bad idea…. I know I’d like to refocus my blogging time on something other than an SEO company! I remember looking for information on semalt and finding very little. How funny to become the “go to” place for info! I look forward to seeing Meghan if she chooses to make an appearance. Thanks so much for the kind words, you two! Meghan is a great character, and the idea for her novel is percolating in the back of my mind. If I can just get this year under control (it’s off to a hectic start), I should be able to make real progress on the rebuild of Madeleine’s novel. And the ideas for the rebuild of my first novel are there, too. Many first novels never see the light of day. But I suspect more of them hold promise than their authors’ realize. Yes, there’s a lot of work involved in recrafting them. But the core ideas and characters may very well be worth the effort. I wish you all the best, too, as you revisit yours! I’ve had a spate of hits from Semalt on my blogspot blog. A couple of people have said they signed up for it and it seems OK. But I try not to click on links that show up on my stats unless I have a good idea what they represent. Better safe than sorry is the best attitude to take when it comes to the Internet. It’s so difficult to tell if something is legitimate or a potential scam or attempt to access personal or financial data. Even in a best case scenario, I’d bet most of these SEO companies really aren’t that helpful at getting meaningful traffic to our blogs and websites. Well, I’d have to say the Wiki referrer is dead on for you. 🙂 Your blog is always entertaining and has some very funny posts, and it’s so good to see you back in Blog Land! After last year’s total loss of confidence, I’m still finding my way with the WIPs. I don’t know whether I’ll ever regain the carefree momentum of 2009 and 2010, but I’d like to see some real progress in 2014 again. If only the day job and life would cooperate, as you probably understand! Your year seems to be off to a good start JM, lots of new plans and projects for the year ahead. I hope it all goes the way you want it to and you meet those deadlines you’ve set yourself. Thanks, Andrea! The year has started off busy on the day job end of things, and that has limited my writing in these first few days. But I’m still plugging away and hope to meet those objectives for the spring. Ultimately, it all boils down to how high a priority I make my writing. Yes, for us in local government it’s budget setting season, which means efficiencies and re-structures, always a hectic and quite depressing time after the festivities and less mental energy to spend on creating.. Which is exactly why we need that balance of creativity in our lives! I really believe in finding balance in life—not that it’s something static that can be maintained indefinitely. Rather, I think it’s a lifelong process of recognizing our needs and desires as we grow older. I’m having a hard time putting my thoughts into words there, so I hope you can figure out what I’m trying to say. If your creative mind works anything like mine, it’s keeping busy in the background while we deal with those pesky work demands! Congratulations on your sudden uptick in readership! Since the cause remains unknown, I’d like to take credit for it if I might. Totally. It got down into the high 40s for a couple days. Can I tell you? It was HELL. Have you recently moved to the UK? That’s where most of the views are coming from this week. We had a nice, sunny day today with pleasant temperatures—they reached the upper 40s. I suspect if I lived in the south, I’d eventually think 40s were cold. But here, they’re just about average. Toss on some heavier clothes and hunker down with a hot beverage. Or do you folks in California even have any heavier clothes?